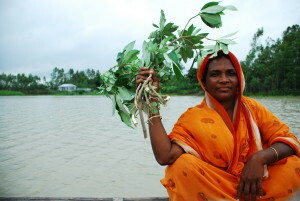 The Meghna River in Bangladesh is a big, fast-moving river in the south of the country. Along its banks, in the communities of Charbata, thousands of poor families make their living from farming the rich alluvial soil and from fishing. Many are members of landless groups organized by Inter Pares’ counterpart Nijera Kori. Wealthy local businessmen have been trying to take control of this area, and last year they claimed they had leased a large area of the river. They planned to build embankments enclosing the area for intensive agricultural production and fishing, depriving people of the riverside land and access to the river. The businessmen signed a secret agreement with labourers from another village to begin the work. It was a victory for the poor over the powerful, of collective action over greed and violence. More than 2,000 people defended hundreds of families’ food security that day, by protecting the land to farm and the river to fish. At the heart of the collaboration with Inter Pares’ counterparts lies the profound belief in the equality of all people. Inter Pares does not have overseas offices in the countries where they work. Instead they choose to support organizations and activists working in their own countries to confront injustice, helping them strengthen their work and increase their impact as Inter Pares also learns from them. These collaborations are not one-way “helping” relationships, but a two-way collaborative relationship.